According to news reports, Mayor Bill de Blasio will announce plans for a Brooklyn-Queens streetcar line during his State of the City speech tonight. Streetcars deserve strict scrutiny. Over a dozen such projects have been launched in U.S. cities since the 1990s, and nearly all have failed to fulfill promises of high usage and efficient travel speed. Among recently built lines, only Portland’s regularly carries more than 5,000 passengers per day—the equivalent of five rush-hour subway trains. In an era when funding transportation improvements is extremely difficult, New Yorkers should ask these and other questions about the proposal. If New York City has $2.5 billion to spend on improving transportation, what evidence indicates starting a streetcar system is the best use of the money? What led City Hall to conclude the Brooklyn-Queens line would be a good deal for taxpayers and straphangers in light of weak performance by recent streetcar projects in other cities? How will the city pay? Is there evidence that enough additional real estate value will be created to support tax-increment financing? Are construction tax breaks factored into the analysis? Much of the property adjacent to the route is undergoing large-scale development without the spur of a new transit proposal. Would more value be realized by supporting transit projects of proven effectiveness in other parts of the city? How will riders pay? Will transfers between systems be free? If not, the line may be used mainly by riders willing to pay two fares. What is the anticipated role of streetcars in the city’s transportation strategy? 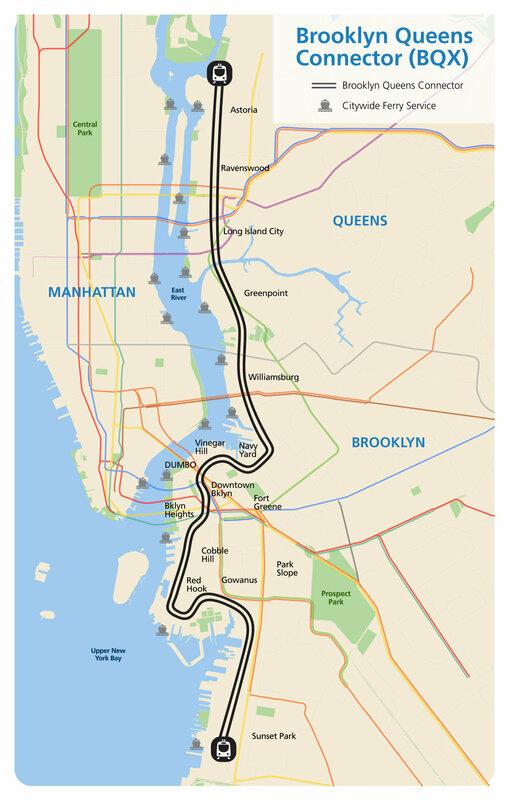 Will the Brooklyn-Queens streetcar be one-of-a-kind, or the start of a new network? When London, for example, began to build its first light rail lines in the 1980s, the routes and stations were slated for an area with little Underground service and the vehicles were designed to operate at high speeds in completely dedicated rail rights-of-way. Today, the service directly connects to Underground stations and a long-range program of expansion was established and remains in effect. What is the market for the line? At present, rush-hour crowding is chronic on the 4, 5, 7, A, E, and L trains, among others, showing that travel demand and capacity needs for Brooklyn-Manhattan and Queens-Manhattan trips are not adequately served by current rail infrastructure. Buses serving the waterfront corridor today move about 30,000 daily riders and most of these routes connect to Manhattan-bound subways, unlike the streetcar. Has the city consulted with these riders in determining the need for a streetcar? Why is the line on the waterfront? A substantial portion will be in the floodplain of the East River. Route maps already released show the streetcar fails to connect with subway stations along much of its route, even though most travel demand in its service area is to and from Manhattan. Additionally, the area that is walking-distance from a streetcar station is naturally cut in half by the presence of the water.